XIN NIAN KUAI LE - HAPPY CHINESE NEW YEAR! The Development and Alumni Relations at Queen’s would like to wish all our Chinese graduates, students and University staff a very Happy New Year – Xin nian kuai le – and best wishes for the Year of the Pig! Chinese New Year, which is also known as the Spring Festival or chunjie, is celebrated by more than 20% of the world’s population. Marking the end of the coldest days of winter, it is the most important holiday in China and to Chinese people all around the globe. Because the Spring Festival falls according to the lunar calendar there is no set date for Chinese New Year, so it can start anytime from January 21 to February 20. In 2019 it starts today – Tuesday 5 February – and ends with the Lantern Festival on 19 February. Chunjie is celebrated at Queen’s by the Chinese Lion Dance society and by the Chinese Students’ Association (CSA). Throughout the year the CSA promotes Chinese traditional culture and during Spring Festival, members of the Chinese Lion Dance society make appearances on campus – and elsewhere in Belfast and around Northern Ireland. 2019 is the Year of the Pig, the twelfth of all Chinese zodiac animals. According to one legend, the Jade Emperor said the numbering of the zodiac animals would be determined by the order in which they arrived at his party. It is said that the Pig was late because he overslept. In Chinese culture, pigs are a symbol of wealth. Queen’s has well-established links with China going back over many years and our alumni have been making a major impact there since the University was founded. Sir Robert Hart, who graduated in 1853 at the age of 18, went on to become Inspector-General of the Chinese Imperial Maritime Customs Service. He also helped establish the country’s postal service, lighthouses, imperial navy and meteorological service. We have many ties today with important Chinese colleges and institutions, including Shenzhen University, the Beijing Institute of Technology and the China Medical University in Shenyang, with which we set up China Queen’s College (CQC) in 2014. The CQC relationship alone will see over 1,000 Chinese students studying for Queen’s degrees in pharmaceutical science. Collaborative agreements have also been signed with Shanghai Jiaotong University, Peking University and the Chinese Scholarship Council all of which build upon the University’s existing links in China, including the £2.3 million Science Bridge project. Queen’s and Southeast University lead the UK-China University Consortium on Engineering Education and Research, which is aimed at building higher education links and helping to improve the quality of engineering research and teaching. As part of the Consortium Queen’s has developed the Future Leadership and Innovation Academy which is now in its second year and has so far brought together 56 students from 18 different institutions across the UK and China. Among those celebrating Chinese New Year will be many of our 2,000+ alumni in China – the University’s biggest alumni network outside of the UK and Ireland. These graduates are primarily in finance, management and process engineering with numbers concentrated in Shenzhen, Beijing and Shanghai. In November 2018 Queen’s launched a new China Alumni Association Group at an event in Shenzhen, which will keep Queen’s alumni in China in touch with each other and with the University. Last September, one of our graduates in China Jerry Brown, BSc (Mechanical Engineering) 1982, PhD 1986, received the Chinese Government Friendship Award at a special ceremony in the Great Hall of the People in Tiananmen Square, in Beijing. Jerry was presented with the medal by H E Liu He, Vice Premier of the State Council of The People's Republic of China and was also invited to meet the Chinese Prime Minister Li Keqiang, the following day. Chinese New Year is responsible for the greatest number of fireworks set off on one night, anywhere in the world. As in the myth about Nian, firecrackers are supposed to scare off monsters and bad luck. People stay up on Chinese New Year’s Eve and set off firecrackers at midnight and in the morning, more are used to welcome the New Year and good luck. That same night, families also burn fake paper money and printed gold bars in honour of deceased loved ones. The event is also said to result in the largest human migration – known as chunyun – in the world. With the most important aspect of Chinese New Year being the family reunion, millions of Chinese people make an effort to return home for the New Year’s Eve dinner. 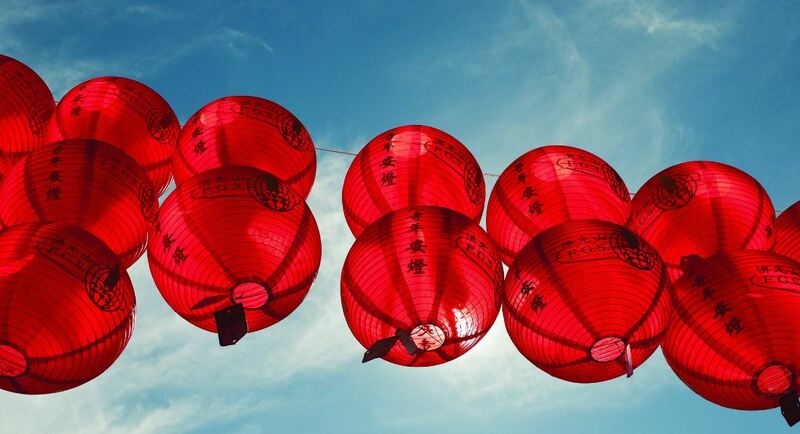 The colour red features largely in celebration of the Chinese New Year as it too is believed to scare away monsters. New clothes are also believed to bring good luck and many people will add new red clothing to their Spring Festival wardrobe too. Children in China receive ‘lucky money’ in red envelopes – also called red packets or pockets – which is supposed to help transfer good fortune from older members of the family to younger children. In addition to the Chinese greeting of Xin nian kuai le – a phrase that literally means Happy New Year – people in Hong Kong and other Cantonese-speaking regions say Gong hei fat choy and in Mandarin Chinese, Gong xi fa cai meaning Congratulations may you attain greater wealth. And if you want to know how to say 'Happy New Year' in Chinese, take a look at our special video here. If you were around the Queen’s campus yesterday (Monday 4 February) you may have caught the traditional Chinese Lion Dance. From 1–15 February, the Language Centre at Queen’s will host a range of cultural events on and off campus covering an Introduction to the Year of the Pig, a Chinese Culture Quiz, music, folk dancing and calligraphy plus and a presentation on the Chinese School of Animation. Full details can be found on Facebook.